Complaining about the heat in February is a rare occurrence but wasn't it joyful to bask in the sun so early this year and at school, half term as well - extra bonus! The above average, seasonal temperature figures were enough to put one into a flat spin under glass though, as spring is a major sowing time and there are many little plants to fuss over. Strong winds have featured too this year so we make sure that glass is closed on windy days to protect it from sudden gusts. A few trees in the Gardens and Arboretum took a battering in recent winds, losing limbs, splitting in two, losing their tops or falling down completely. Just one of the reasons that gardening is an ongoing process and never a finished product. Sometimes the trees that fall are massive, but their demise however opens up opportunities for new plantings, which is always a good thing as we should all be planting more trees for the future anyway - your garden, my garden, everyone's gardens. The naturalised crocus and snowdrop display has segued nicely into daffodils, which are nodding furiously throughout the gardens, and as you walk around you will find them everywhere. They look glorious intermingled with blue anemones or blue scillas - just generally jolly and joyful which is just what we need to lift our spirits. We're in the last stages of repotting potted display plants. It's a mighty effort which takes about three months of solid work along with managing the day-to-day tasks under glass. Now there are displays to see in the fern, tropical, temperate and salad glasshouses as well as the crops under production in the pit houses. 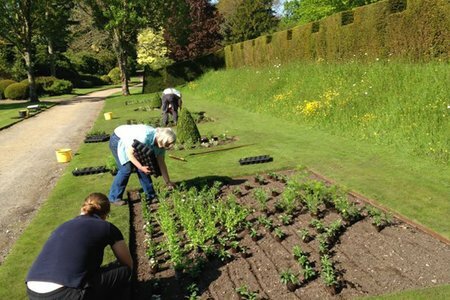 In spring, gardeners are constantly on the move making sure that their horticultural charges are behaving impeccably. 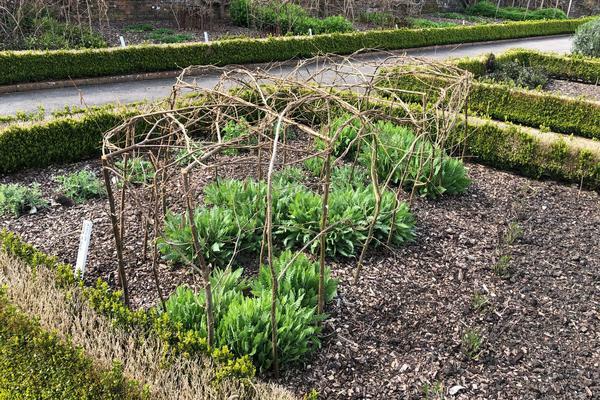 The Kitchen Garden is coming to life - seakale is poking its head above the mulch, the rhubarb is ready to harvest, first early potatoes have been planted as have garlic, onions and parsley. There's also action on the cutting border with new season's cut flowers sown directly so it won't be long before the new crops are up and flowering. The bulb displays continue in the Orchard, now it's the turn of the snakes head fritillaries which look fantastic with primroses flowering near-by. This is a bulb which keeps on giving as it's increased in number considerably since we planted the original bulbs years ago. On bright spring days there's nothing better than visiting the Gardens and seeing what else is in flower since your last visit. 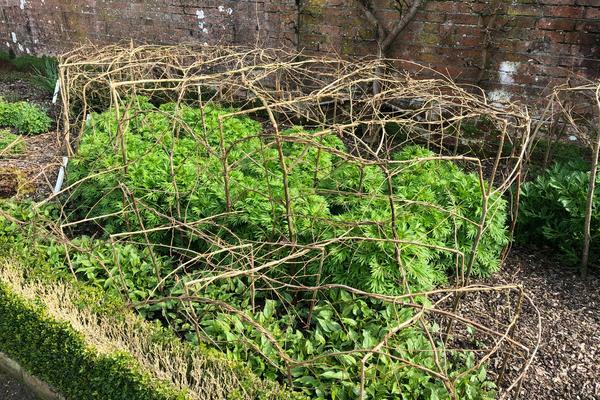 Anne, the border Queen, is scampering around the borders creating hazel structures for herbaceous perennials which, if left unattended, get too big for their boots. 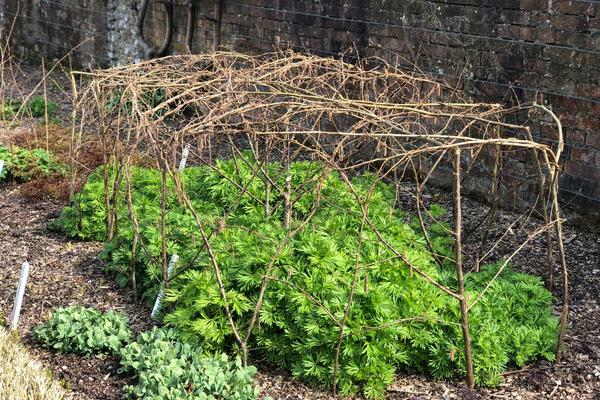 Some of these will also receive the Chelsea chop in May to restrain their rampant growth. 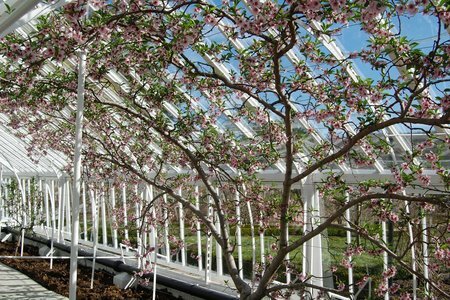 However, in spring time the structures are admirable objects in themselves offering inspiration to garden visitors. 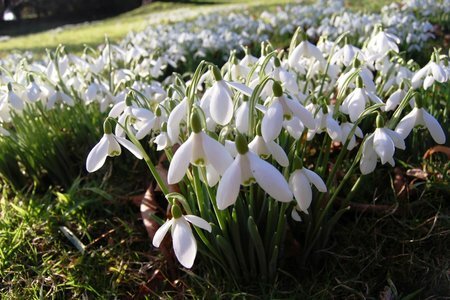 Do not forget your weekly walk up to the Arboretum or your tea and cake on return and keep up to date with all things West Dean, such as the Easter Trail, by visiting our website www.westdeangardens.org.uk.